I bought the smaller, travel size setting spray as I didn’t want to go all out if I wasn’t going to like the product. What sold this product the most to me was its ‘oil-control’ feature. I have quite oily skin, and throughout the day my makeup has been known to slide off my face. So why wouldn’t I want to give this a go? I only use this if I’ve applied a decent amount of makeup because I don’t really want to waste the product if I’m only wearing a bit of concealer & mascara. Anyway onto what I really think of the product! I’ve always been slightly skeptical about setting sprays, like do they really work or are they just a gimmick? The reason I went for Urban Decay’s offering is because I trust them as a brand, I love their eyeshadows and they’re always long lasting. I must say this stuff is pretty damn good. I’ve used it several times and I must say my makeup is almost as good as when I started off the day. As for the oil control, I’m not 100% sure. I suppose it helps slightly but if you do have oily skin I think its quite difficult to find anything that really works to control the oiliness. 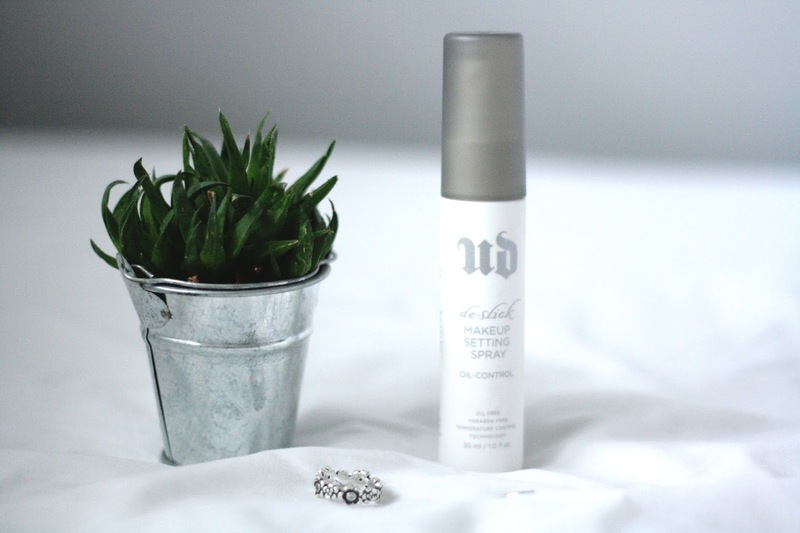 But I’m really happy with this setting spray and I feel it does hold my makeup in place pretty much all day. I will most likely be purchasing the full sized version once this one runs out! Whats your favourite setting spray?